The Virginia Horse Council will hold its annual meeting and seminar on March 30 at the Virginia Maryland Regional College of Veterinary Medicine in Blacksburg, Virginia. Educational sessions will take place throughout the day, beginning at 9 a.m. Cost to attend is $20 for council members and $25 for non-members. Lunch is included. Sue Fanelli, chairman of the Virginia Horse Council board, will talk about the council’s Cruelty and Abuse Project at 9 a.m. Other topics throughout the day include Equine Cushings Disease, law requirements for horse owners, mud management, veterinarians expectations for standard of care, and a Make a Horseshoe lab. Speakers include Jill Deegan, Dr. Scott Pleasant, Carrie Swanson, and Paul Papadatos. The day will also include vendors, a silent auction and networking opportunities. For more information, contact info@virginiahorsecouncil.org. Eileen Brent Beckman, of Otteridge Farm in Bedford, Virginia, was inducted into the Virginia Livestock Hall of Fame last week at Virginia Tech. Beckman, well-known for breeding and raising champion hunter ponies, was nominated for the honor by the Virginia Horse Council. Born in 1918, Beckman was not raised in a horse-riding family. But the love of horses still prevailed. In the 1940s she bought and rode a thoroughbred hunter, Ramos, to great success. After serving in the Red Cross — where she met her husband, Carl — and living in Chicago for a bit, she would move to Virginia and establish the famed Otteridge Farm. There at the base of the Peaks of Otter, she taught riding lessons and bred champion hunter ponies. Beckman is a founding member and past president of the Virginia Pony Breeder’s Association and also is in the National Show Hunter Hall of Fame. Among the farm’s many success stories were Otteridge Dreaming Of Blue, Otteridge Dress Blues, Otteridge Black Hawk, Otteridge Pow Wow, Otteridge Foxtrot, Otteridge Up In Lights and Otteridge French Twist. Otteridge Farm has always placed a great emphasis on breeding ponies with great temperaments and that can be handled by children. Poor temperaments are not tolerated in their breeding program and there are no stallions standing at the farm. Eileen Beckman died in May 2010 at the age of 91. Otteridge Farm’s tradition as a top-notch breeding program continues, with Beckman’s family, including daughter Randee Beckman and grand-daughter Katie Gardner, at the helm. Two years ago, Sarah Shinault, now 14 and a freshman at Staunton River High School, asked for a mini for Christmas. 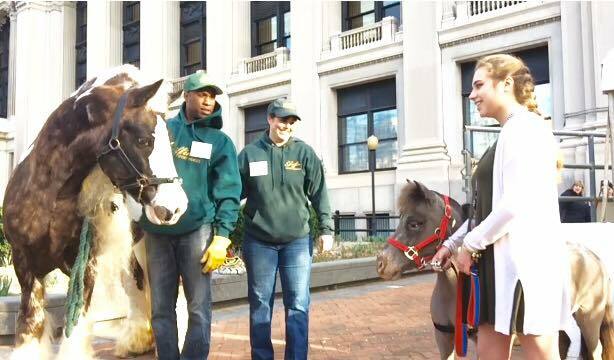 Her parents, Steven and Robin Shinault — who are both respiratory therapists at Carilion in Roanoke and very supportive of her love for horses — got her Cash, an Appaloosa-colored mini yearling, for her that Christmas. Sarah has riding horses that she shows in hunter shows but she wanted a mini. She and Cash, who will be 3 in June, completed Pet Partners training and the pair are now a certified therapy team. 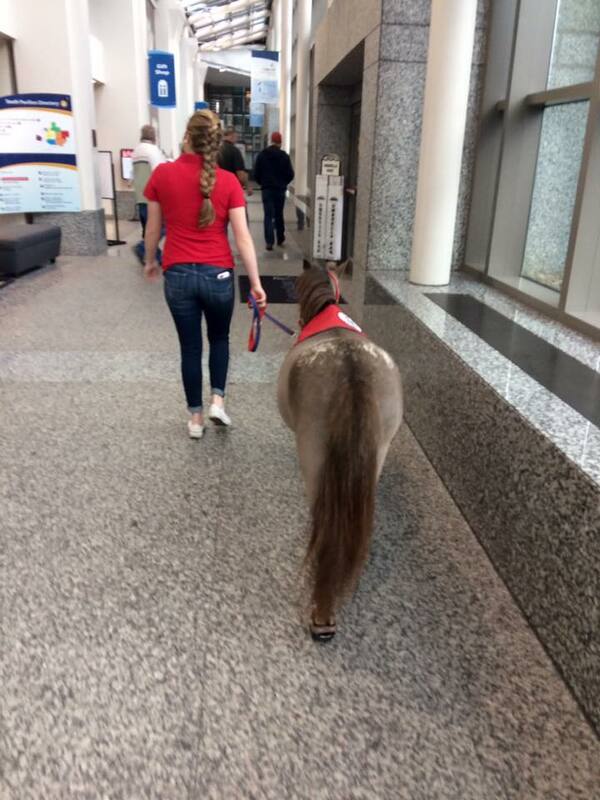 They were the first certified miniature horse therapy team in the Roanoke area and one of only eight teams certified in the state. Cash has his own van, the Cashmobile, that is used to transport him, along with Sarah, to their appointments, with Robin Shinault acting as chauffeur. Cash and Sarah go to Berkshire Nursing Home and the pediatric unit at Carilion Roanoke Memorial Medical Hospital unit regularly to visit patients. The two also have visited Patrick Henry High School. When the visits are done, Cash is treated to a drive-through meal from McDonald’s: French fries and apple slices. He eats the Apple slices and kicks the salt from the French fries. 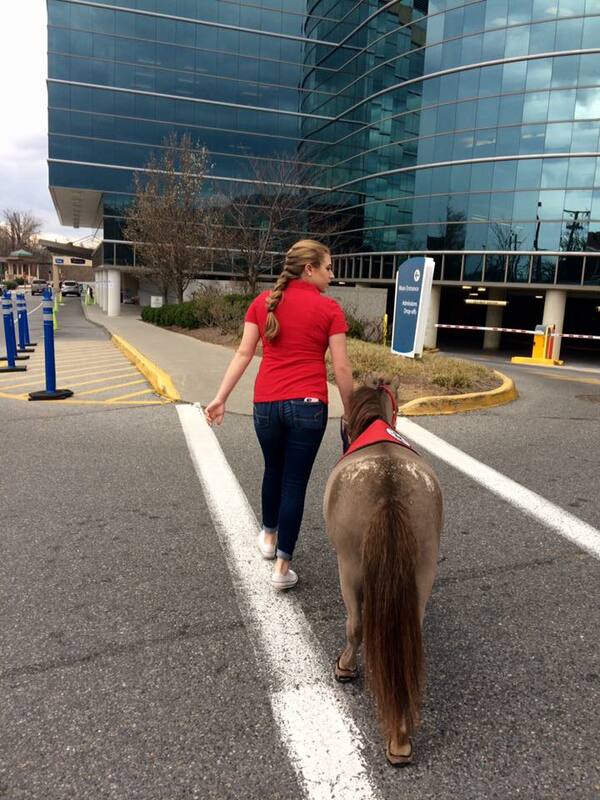 Cash and Sarah visit Carilion Memorial Hospital in Roanoke regularly. Recently, Cash and Sarah made a different kind of visit. 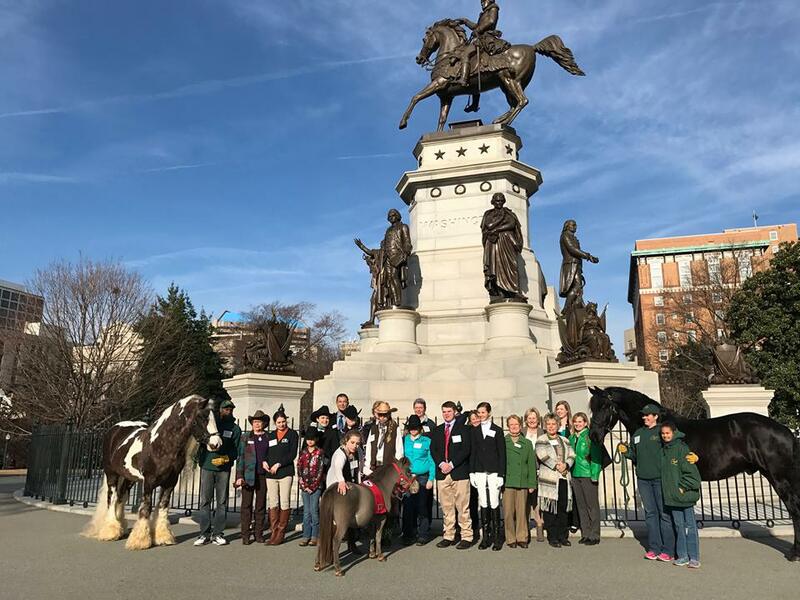 On Tuesday, Feb. 21, the Virginia Horse Council sponsored a Youth Recognition Day at the General Assembly in Richmond. Young equestrians from all over the Commonwealth came to Richmond and were introduced from the gallery of the General Assembly by Rep. Terry Austin (R-19th District) and Emmett Hanger (R-24th) with thanks for their dedication. 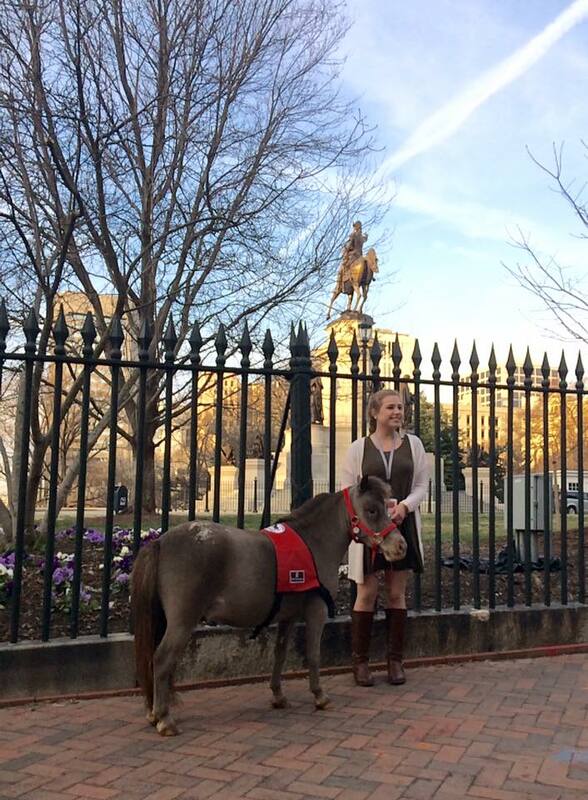 About 500 people stopped by to meet the young people and the horses, including Gov. 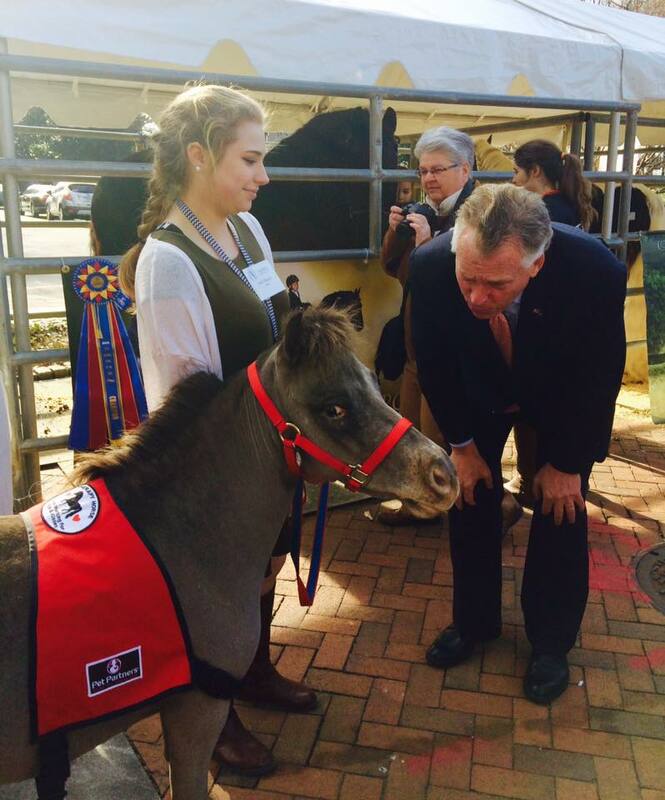 Terry McAuliffe. Sarah and Cash were there to greet the crowd and Cash shared a chat with the governor. 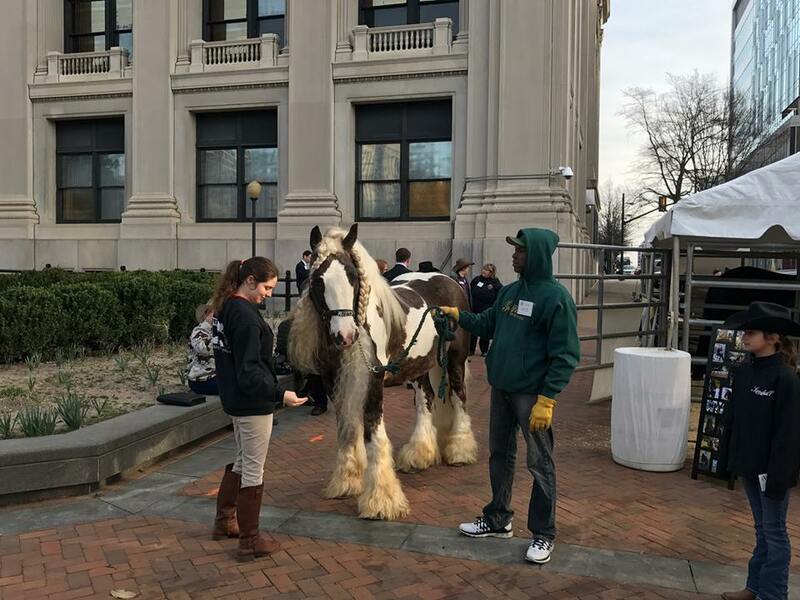 Griffin SportHorses of Gretna, Virginia, also brought two of their superstars, a Friesian gelding and a Gypsy Vanner stallion, for the enjoyment of the legislators. The Franklin County Equestrian Club was presented the award for Equine Club of the Year at the Virginia Horse Festival on April 2. Pictured, from left, Terri Bentley, former club secretary; Michaela Bentley, member; Emma Brubaker, member; Nancy Brubaker, DVM, member; Patricia Wray, club co-founder and president; Tim Wray, club co-founder; Charles Brubaker, member. The Franklin County Equestrian Club (FCEC) was named the Virginia Horse Council 2015 Equine Club of the Year award for its service and commitment to the Virginia Horse Industry. The award was presented at the Virginia Horse Council’s annual meeting and luncheon during the Virginia Horse Festival in Doswell, Va., on April 2. The club, which is open to all riders and disciplines, hosts many horse shows and activities throughout the year and has more than 100 members. On April 30, the club will holdits Spring Fling Horse Show (re-scheduled from April 9). Jeff Cox is the judge for the open show that includes classes for Hunter, Western, Games and Gaited horses. It will be held at the Ginther Farm (3128 Sontag Road, Rocky Mount) in Rocky Mount, Va., and begins at 9 a.m. The club holds competitive trail rides as one of its many events through the year. The club, which is going on its sixth year, also has scheduled in 2016 a Turn and Burn Series, a competitive trail ride at Fairy Stone Park in July, an annual open horse show in August and the Franklin County Fair Horse Show in September plus much more.They also sanction other shows such as the Cross View Show Series at Green Hill Park near Salem. While for now the club uses Ginther Farm and other venues for its events, the club has been working to develop an arena in Franklin County. Earlier this year, the Franklin County Board of Supervisors voted to contribute up to $5,000 toward the club’s efforts to build a new arena on county-owned property along Sontag Road in Rocky Mount. That money is expected to pay for an application for a commercial driveway permit as required by the Virginia Department of Transportation and determining whether a turn lane should be installed based on traffic patterns in the area. The club said it will pay for the construction of the arena on the property. To learn more about the FCEC, visit its Facebook page or its website at www.FranklinCountyEquestrianClub or call (540) 420-8169.